she's 14 and spending every dime her parents give her lining her favorite bassist's pockets! 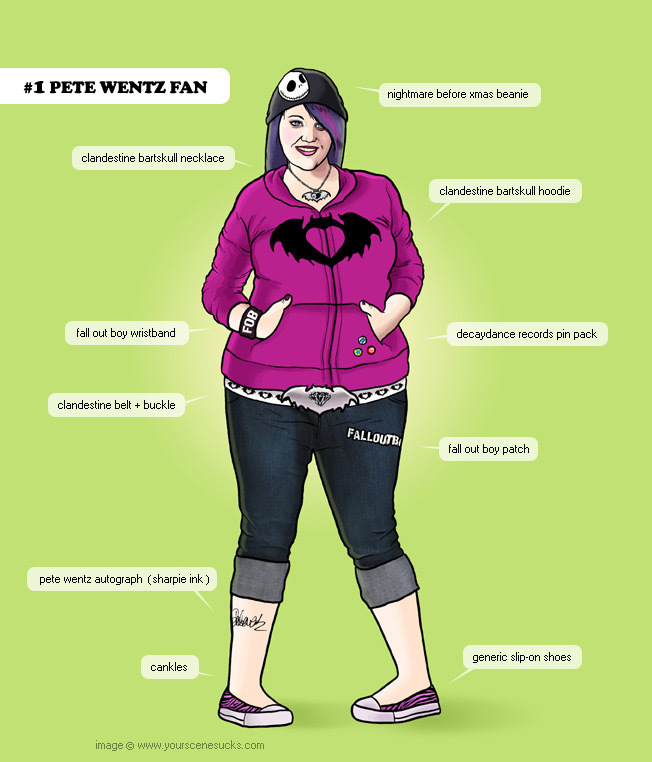 pete wentz is her idol and in her eyes he can do no wrong, whether he's designing teeshirts, sponsoring bands, or posing half-naked for gap. the would-be tattoo on her calf? she stood outside a chili's for three hours in the freezing chicago winter in order to wrangle that one. it's sharpie right now, but the minute she turns 18 it's going permanent. she's sick of all the kids at school who claim to be fob fans, she has been there since the bands inception (2006). she knows no one loves her boys like she does; she may be young, but she's absolutely convinced she'll eventually be pete's one true love.